The Maryland Energy Administration’s Alternative Fuel Infrastructure Program (AFIP) is intended to aid in the development of public access, alternative fuel refilling/charging infrastructure in the state of Maryland. As such, MEA anticipates issuing one or more grants to applicants for installation of alternative fuel refilling/charging stations in Maryland. Here we are pleased to focus on expansions on the Eastern Shore of the state. With the funds awarded from the fiscal year 16 AFIP, Sharp Energy now has the ability to deploy more vehicles that can run on propane autogas fuel, which reduces emissions while also yielding economic benefits for their fleet in Talbot and Queen Anne Counties. Collectively, the 2 fueling stations have the potential to displace over 55,000 gallons of petroleum per year. 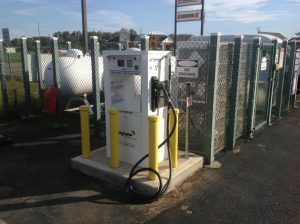 One propane autogas fueling station is located at 9387 Ocean Gateway, Easton, MD. This fueling station not only provides fuel to Sharp Energy, but also to Eastern Shore Coffee, Bay Runner Shuttle, and Talbot County Public Works. Sharp reports that there are currently11 vehicles fueling from this location on a monthly basis. 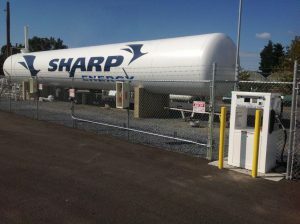 Sharp Energy also received funding for a second fueling station that is located at Western Auto, 1406 Main St, Stevensville, MD. In addition to providing fuel to Sharp Energy, Eastern Shore Coffee, Bay Runner and three buses from the Queen Anne’s County School District also fuel at the station.